I've been writing a lot about anatomy lately. It seems that much like buses, exploded physiques, annotated musculatures and preserved parts of corpses seem to come along in groups. Appropriately, I've been progressing through them roughly chronologically starting with the notebooks of Leonardo da Vinci, to the dusty and mysterious bones of 'Bison to Bedlam' and 'Buried on Campus', and now to the plastinated creatures of 'Animal Inside Out'. The Natural History Museum, even on a busy Saturday at the height of tourist season, is always a wonderful place to visit. Passing through the front doors and being greeted by the breathtakingly majestic Diplodocus skeleton makes me feel like a child again. 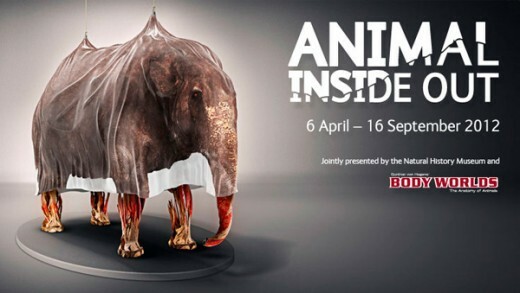 I could easily spend a whole day wandering around the different galleries, but time was relatively short yesterday and I made a beeline for 'Animal Inside Out'. 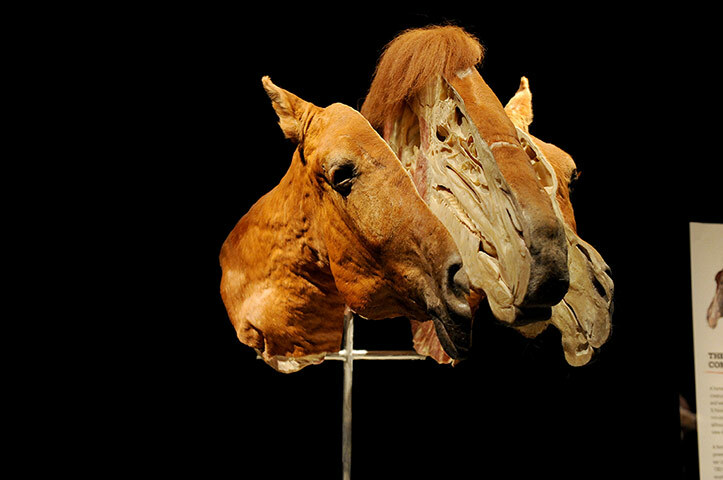 The exhibition is the latest project from Dr Gunter von Hagens' 'Bodyworlds' workshop. They are famous for their various touring exhibitions which showcase plastinated human bodies in a variety of poses and in various states of assembly. The plastination process is a revolutionary way of displaying preserved bodies - water and fat are replaced by various plastics which allows the texture and shape of organic material to be retained, leaving a specimen which doesn't smell or decay. The applications in teaching are obvious, but the results are so striking that the touring exhibitions regularly sell-out worldwide. 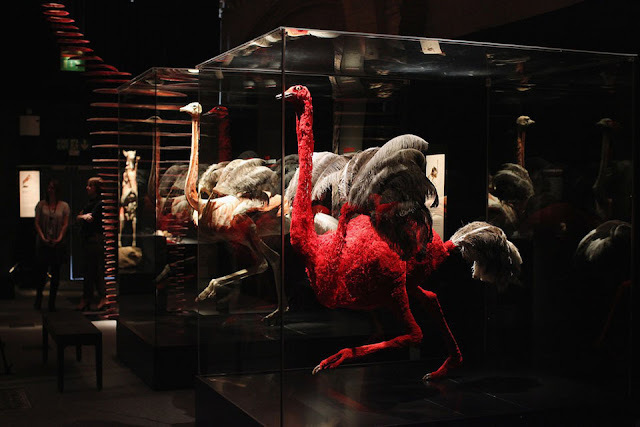 This exhibition is the first time that this process has been applied to the animal kingdom, with impressive results. One of the first things that strikes you as you enter the exhibition is the atmosphere. It feels more like an art gallery than a museum. This exhibition apparently aims to educate more than appeal to aesthetics, but it's hard not to get swept up in the beauty of the exhibits rather than coolly examining them with a scientific eye. 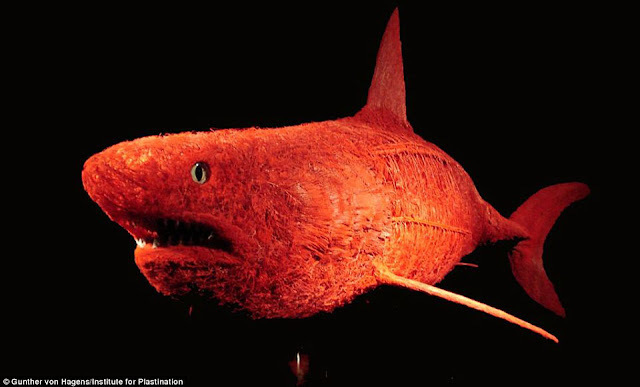 You're first confronted with a large bisected squid, and a blood red shark. Both of these, the shark especially, are a bit sensorialy overwhelming - and rather than trying to analyse I found myself admiring them primarily as beautiful objects. The shark in particular is stunning, posed and lit expertly, the red of its capillaries seeming to glow in the spotlight it sits in. It contrasts the obvious power of the animal with a fragility implied through complexity. The life of this shark, as all organisms, relies on an infinitely complex set of biological machinery that is almost impossible to comprehend visually. This first room is dedicated to aquatic specimens, and sets the template for the rest of the exhibition. There are 3 or 4 'superstar' specimens - full plastinations of creatures that highlight a particular aspect of their anatomy - and a series of smaller display cases that showcase smaller plastinations and individual organs from animals. Very quickly you notice that they are quite economical with information. The information panels tend to tell you what the interesting features are in a few sentences, with maybe a small piece of trivia. Ordinarily I prefer to have as much information as possible available during an exhibition, but here less is more. The specimens tend to speak for themselves, and the way in which they're laid out or 'exploded' tells us more than paragraphs of signage ever could. It's refreshing that in a top summer exhibition we're allowed to draw our own conclusions about what we're looking at, rather than being directly told. 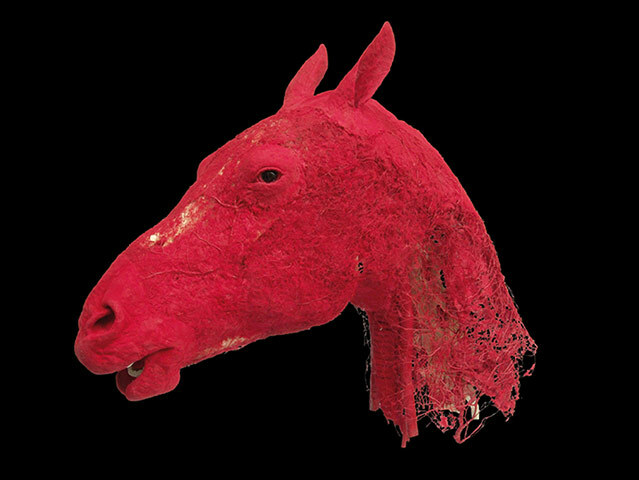 Plastinated horses head showing the coverage of capillaries. As you progress through the exhibition, the specimens gradually become more and more impressive. Every time you round a corner, what is behind it tops what has come before. The first full plastinated mammals we see are sheep and goats, and it's here that you begin to appreciate the importance of plastination as a teaching aid. Whilst there are omnipresent signs warning us not to touch the exhibits, we are allowed to get as close to them as we went. If you want to bend down and look into the intestines of a sheep then you are able, indeed, the way they are exhibited seems to invite this closer scrutiny. In most instances, you are able to view the animals from any angle, you're free to move around them and examine whatever takes your fancy. One of the most fascinating exhibits in this section was a trisected horse's head, cut lengthways. These types of 'split' plastinations were among my favourites; they allow you to see the mechanics of how everyone fits together and (somewhat uniquely for an anatomical display) how tightly packed together anatomy is. Generally, for purposes of comprehension, anatomical systems are usually displayed in a somewhat simplified form - we are able to easily distinguish between different colour-coded organs, and nervous and circulatory systems are portrayed as diagrammatic. What you begin to appreciate here is how complicated and 'busy' internal anatomy is. Everything is packed tightly together, and is generally the same colour. You'd think it'd be easy to spot major features like the spinal cord, or the brain, but it's far from immediately obvious. Another way in which the exhibition succeeds is to show us the animal 'in motion'. One of the most dramatic instances is the bull plastination. The animal seems frozen in mid-frenzy, about to charge forward and gore anyone in its path. The exposed muscles along the flank of are taut and tense, and everything seems to suggest a fluid sense of motion and power. This is another example of an instance in which we do not need any more information provided than what we can see before us. The pose provides all the context we need. The sheer size of this model, the largest we've seen so far is also impressive, and sets the stage for what's to come. 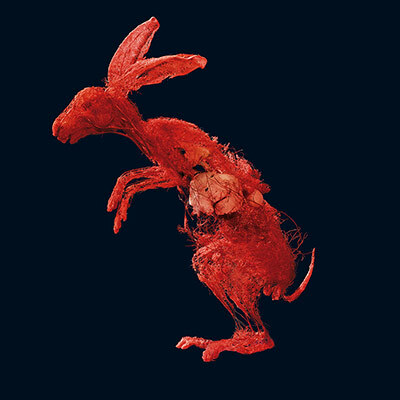 Circulatory system of a rabbit. Passing reindeer in motion, we're able to see precisely how the the muscles high up in the body provide the energy for the slender legs below - allowing the quick acceleration that it relies upon to escape from wolves. We move to a small display case showing models of the circulatory systems of a duck, a rabbit, a pig and a lamb. These, as beautiful as they are, seem like a bit of a climb down after the bull, but then you turn the corner and are face-to-face with the colossal elephant plastination. The elephant is probably the single best anatomical exhibit I have ever seen. It's both astoundingly aesthetically appealing and a stunningly clear way of presenting information. It's hard to think of a better way to convey the sheer mass of the creature than this. The head and trunk are neatly split in two, allowing us to peer through the head and through the neck to the internal organs. From the side we can see it's huge guts, the flesh separated from the body creating a sort of cocoon for them. The muscles of the legs are shown flowering outwards from the bone, showing both their individual beauty and how they all fit together. Below, the nervous system has been separated and laid out roughly in relation to the body above. 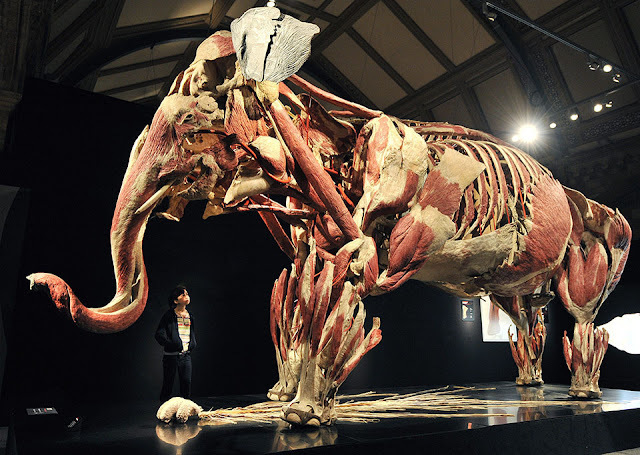 It is relatively easy to imagine the plastination processes of the smaller animals, but it boggles the mind how the elephant has been created. It's the kind of exhibit you could appreciate for hours from every angle. Alas, the museum was closing, and I had to leave. This exhibition costs £9 to enter, and it's worth every penny of it. A huge amount of thought has been put into the layout, presentation and lighting. Each area builds on the one before, and complements the one to come, adding layers upon layers of context to what we are seeing. If I had some minor criticisms, then it'd be that we do not get to see any large carnivore plastinations. I suppose this is a function of the fact that all the animals featured have died naturally - nothing has been killed for the exhibition - and I suppose a lion or tiger carcass is a hot commodity amongst zoologists. 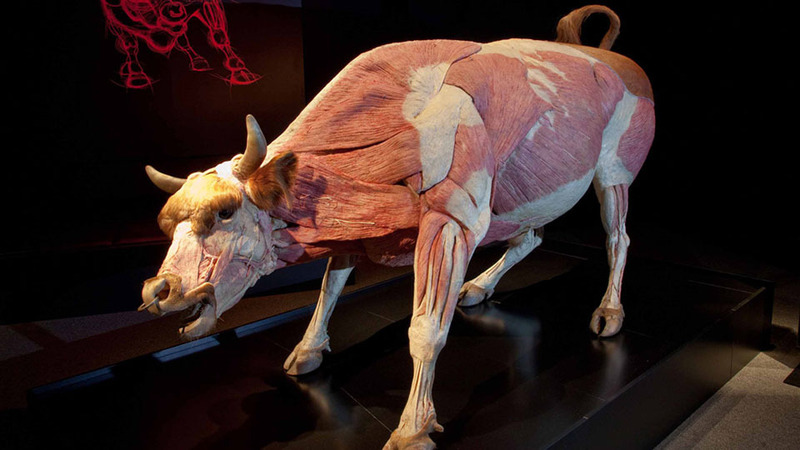 This is exactly the kind of exhibition that the Natural History Museum should be putting on, a perfect mix of information and aesthetics that you can't help but walk out of with a renewed appreciation of the aesthetics, beauty and complexity of anatomy.